A native plant that can be grown for the flowers or the fruit, Atractocarpus fitzalanii, (syn Randia fitzalanii) is commonly called both Native Gardenia and Yellow Mangosteen. The foliage is attractive, which makes it a popular small to medium shade tree. The fruit contains multiple seeds, so growing for the fruit is probably for the enthusiast. The actual taste of the fruit is variable, different plants have different tasting fruit, some better than others. Fruit from a good variety will be large with small seeds, it will also be sweet. Propagation has been from the better tasting plants by cuttings, rather than from seed. Best grown in tropical to sub tropical climates this is a rainforest tree. It requires a humus rich moist yet well drained soil. The native gardenia can be grown further south as long as it is in a warm protected position, frost free and with adequate water over summer. Protection from strong winds is recommended. We also suggest mulching around the plant and keeping the area beneath the tree weed free. Additional water through dry summer periods may be required. Pruning is generally not required except for the removal of dead or damaged branches, or to prune to size and shape. Common Names – Native Gardenia, Yellow Mangosteen. Height – Will reach around 8 metres, often less. 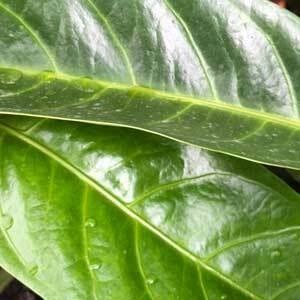 Foliage – Mid green, glossy and attractive. Drought tolerant – Yes once established, better in moist soils. Frost tolerant – Light frost only. The Native Gardenia is available for sale from the following participating Nurseries.